BETHLEHEM (Ma’an) — At least four Israelis were killed and 10 injured in a shooting at the Sarona Market in Tel Aviv around 9:30 p.m. on Wednesday night, according to Israeli emergency Services Magen David Adom (MDA). Israeli police spokeswoman Luba al-Samri said in a statement that the shooters, whose names have yet to be confirmed, were two Palestinians from the same family from the town of Yatta, south of the city of Hebron in the occupied West Bank. Multiple gunshots were heard at the open-air shopping center in the heart of Tel Aviv, adjacent to Israeli army and Ministry of Defense headquarters on Wednesday evening. According to al-Samri, shots were fired both inside and outside of the Sarona Market. According to Haaretz, two armed men “disguised as Orthodox Jews” opened fire at passersby near the Benedict restaurant and then at the nearby Haarbaa Street. 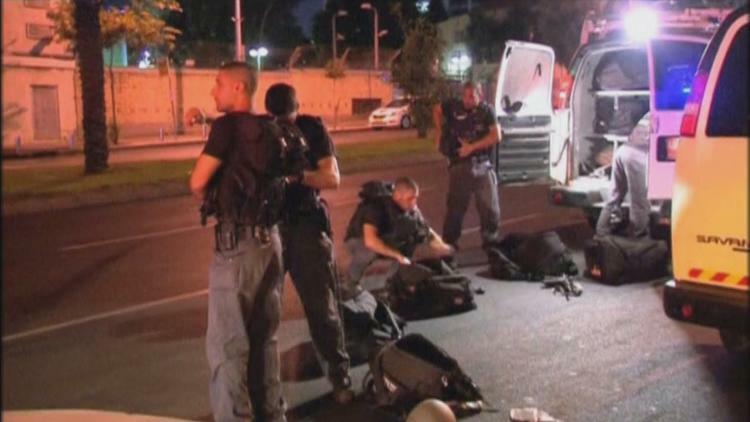 Haaretz also reported that at least six of the wounded had been evacuated to Tel Aviv’s Ichilov Hospital and that another was taken to Sheba Medical Center, Tel Hashomer. At least three were in moderate condition after they underwent surgery and two in light condition. The injured at Sheba was reportedly in moderate condition. Al-Samri said that both suspected shooters were in custody and being treated at Ichilov hospital — one in critical condition and one in mild condition. In the same statement, al-Samri refuted claims of a third suspected assailant, but said investigations were still ongoing. In her initial statement regarding the shooting, al-Samri reported that one alleged assailant had been “neutralized” and was reportedly lying on the sidewalk on Haarbaa Street, which has been completely closed. Al-Samri added that the shooting was a suspected “terrorist attack,” but that investigations were still ongoing. According to Haaretz, Israeli Prime Minister Benjamin Netanyahu, who returned to Israel on Wednesday from Moscow, convened a security briefing in Tel Aviv, and announced a meeting scheduled for Thursday, which will be attended by Defense Minister Avigdor Lieberman, Shin Bet chief Yoram Cohen, and Police Commissioner Roni Alsheich. More than 200 Palestinians and nearly 30 Israelis have been killed since a wave of unrest began in Israel and the occupied Palestinian territory in October. The surge of violence has been largely characterized by small-scale Palestinian attacks on Israeli military targets and settlers. According to Al-Samri, Israeli Minister of Public Security Gilad Erdan was holding an emergency meeting regarding the shootings on Wednesday night.